Former Union minister and Congress' Madhya Pradesh unit president Kamal Nath is set to take over the 18th Chief Minister of the central state. MP Chief Minister (CM) Race highlights: Former Union minister and Congress’ Madhya Pradesh unit president Kamal Nath looks set to take over the 18th Chief Minister of the central state. On Wednesday, Madhya Pradesh Congress media in-charge Shobha Ojha informed that newly elected MLAs have unanimously chosen their leader. Though Ojha did not reveal the name when asked by reporters, reports are doing the rounds that MLAs have preferred Nath over Jyotiraditya Scindia and that he would be the next CM. TV reports say that Jyotiraditya Scindia has also backed his candidature. According to Ojha, party’s observer AK Antony met MLAs on Wednesday to seek their feedback and he will convey the same to Congress president Rahul Gandhi who has been authorised by the legislators to a final call. In the just concluded elections in Madhya Pradesh Congress, the Congress won 114 seats, making comeback after a gap of 15 years. Although it failed to gain a majority on its own in the 230-member House, the party has support of 2 BSP and 1 Samajwadi Party MLAs. The BJP won 109 seats. "I'll make absolute efforts to live up to the expectations of the people of Madhya Pradesh. We will fulfill all the promises mentioned in our manifesto. I'll be meeting the Governor tomorrow at 10:30 am". Chief Minister-designate Kamal Nath to meet governor tomorrow at 10:30 am. After this, time will be decided on time and date of oath taking ceremony. Chief Minister-designate Kamal Nath thanks people of the state. Expresses confidence that future of the state will remain secured. Tyhere is no clarity yet on oath taking ceremony. Madhya Pradesh CM-designate Kamal Nath is likely to speak to media shortly. After much discussions among senior leaders in the Congress he has been appointed as the chief minister of the state kate evening. Madhya Pradesh Chief Minister-designate Kamal Nath thanks Jyotiraditya Scindia for support shortly after being announced as leader of Congress Legislative Party. He will now be the next chief minister of Madhya Pradesh. Senior Congress leader Kamal Nath has been announced as CLP leader. He will now be Madhya Pradesh chief minister. Congress Legislative Party (CLP) meeting has begun in Bhopal to elect the new leader. The name of the new chief minister to be announced officially soon. AK Anthony also there in the meeting as an observer. Congress party sources in Madhya Pradesh indicated that the Congress was also toying with a formula to have deputy chief ministers in Madhya Pradesh and Rajasthan, news agency PTI reported. Senior Congress leader Kamal Nath lands at Bhopal airport from where he will head towards Congress Party office to attend key Congress legislature party meeting slated around 10 PM. Jyotiraditya Scindia also accompanies Kamal Nath. Both the leaders were given a warm welcome by their supporters upon their arrival. In Bhopal, a meeting of the Congress legislature party is slated around 10 PM, where the announcement of the chief minister will be made. Kamal Nath and Jyotiraditya Scindia held separate meetings with Congress President Rahul Gandhi, where UPA chairperson Sonia Gandhi was also present. 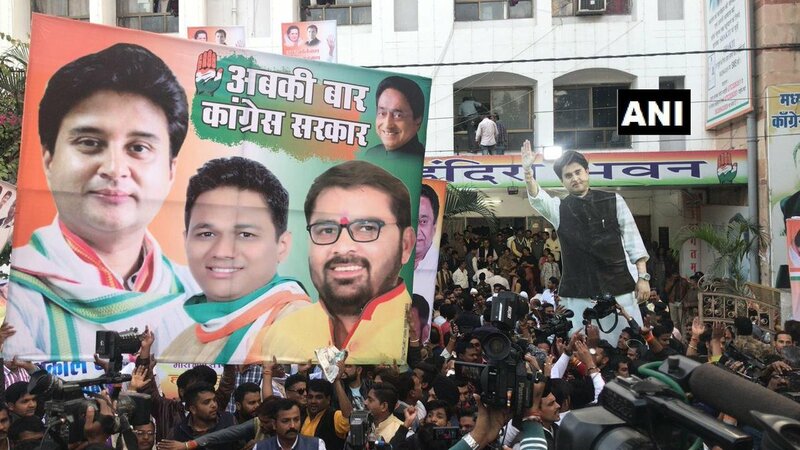 The Congress Party workers thronged the party office in Bhopal with posters and cut-outs of Kamal Nath as the reports of him becoming the Madhya Pradesh chief minister surfaced. Delhi BJP spokesperson Tajinder Pal Singh Bagga says he will begin a "fast unto death" if senior Congress leader Kamal Nath is appointed as Madhya Pradesh Chief Minister. Rahul Gandhi has chosen Kamal Nath as the next chief minister of Madhya Pradesh, ABP News, Aaj Tak and NDTV have reported citing sources. 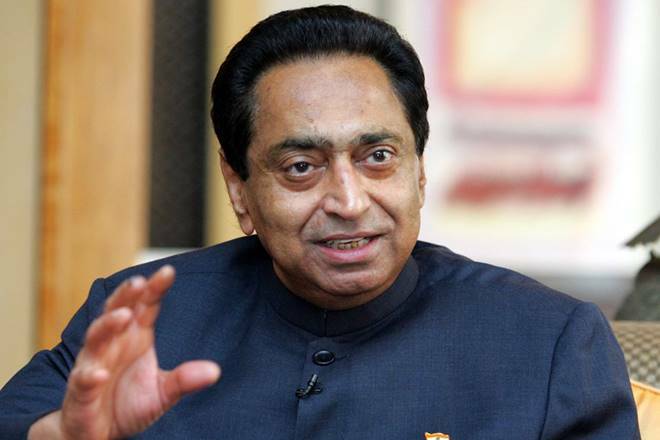 Kamal Nath is currently serving as the state unit chief of Madhya Pradesh. Earlier, Congress president Rahul Gandhi had tweeted a picture with senior Congress leaders Jyotiraditya Scindia and Kamal Nath. "The two most powerful warriors are patience and time" Gandhi captioned the picture. 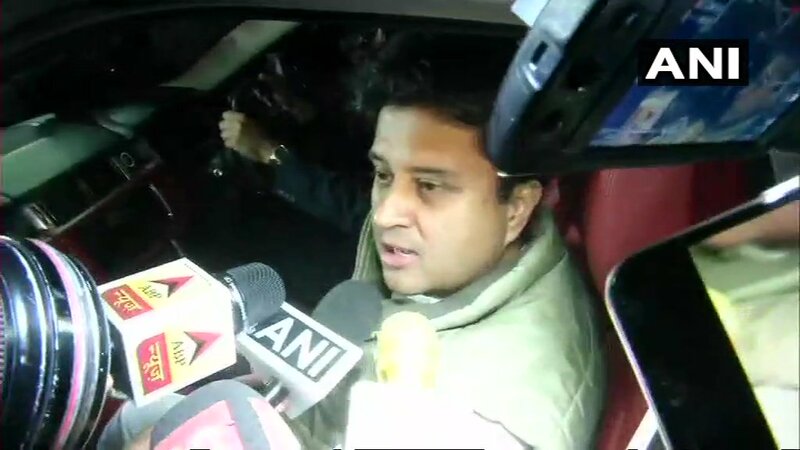 Senior leader Jyotiraditya Scindia has said that he is leaving for Bhopal. He added that there will be an announcement regarding the chief minister today only. "It is not a race, it is not about kursi, we are here to serve the people of Madhya Pradesh. I am leaving for Bhopal and you will get to know the decision today," Jyotiraditya Scindia said. 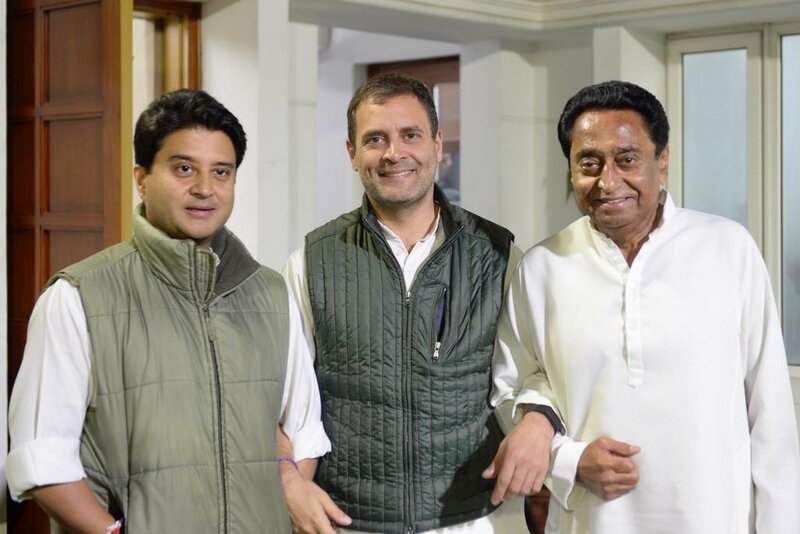 Congress president Rahul Gandhi has tweeted a picture with senior Congress leaders Jyotiraditya Scindia and Kamal Nath. "The two most powerful warriors are patience and time" Gandhi captioned the picture. Meeting at Rahul Gandhi's residence has ended. The meeting included Kamal Nath, Jyotiraditya Scindia, Priyanka Gandhi Vadra and Sonia Gandhi. Kamal Nath said that the chief minister will be decided by MLAs. Both Kamal Nath and Scindia will be a part of a meeting with party MLAs in Madhya Pradesh's Bhopal. The legislature party meet of Madhya Pradesh Congress will take place after 9 pm, various reports have said. The potential chief ministers in Rajasthan and Madhya Pradesh were earlier called in from Jaipur and Bhopal for last minute discussions with the party president before a final call is taken on who will be the chief ministers. The state legislature parties of Rajasthan, Madhya Pradesh and Chhattisgarh had on Wednesday passed one-line resolutions authorising the party president to take the final decision on chief ministers. 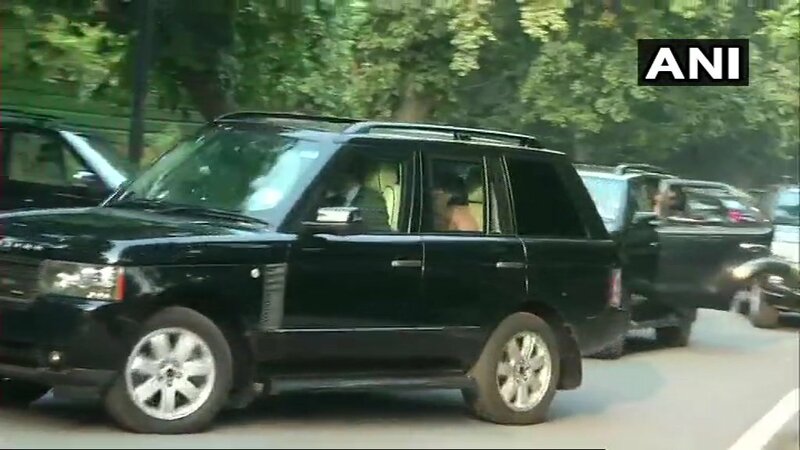 UPA chairperson Sonia Gandhi and her daughter Priyanka Gandhi Vadra have left Congress president Rahul Gandhi's residence. Sonia and Priyanka had arrived at Rahul Gandhi's home on Thursday as suspense escalated on who would be named the chief ministers of Rajasthan, Madhya Pradesh and Chhattisgarh. Earlier in the day, the Congress chief had held talks with the party's central observers in the states, who gave him inputs on the views of the newly-elected legislators in the three states. Sonia Gandhi drove to Rahul Gandhi's Tughlaq Lane residence to discuss the choices for the new chief ministers, party sources told news agency PTI. Senior Congress leader Digvijaya Singh has said that delay in the announcement of chief minister's name is taking place due to Rajasthan. The former MP CM suggested that selection of chief minister was almost final and there was hardly any doubt left. However, Rajasthan Congress leader Ashok Gehlot said that such big decisions take time and Singh has no right to make such statement. Madhya Pradesh: Supporters of Jyotiraditya Scindia have gathered outside Congress party office in Bhopal. One of the posters have declared Congress campaign committee chief Jyotiraditya Scindia as the chief minister. 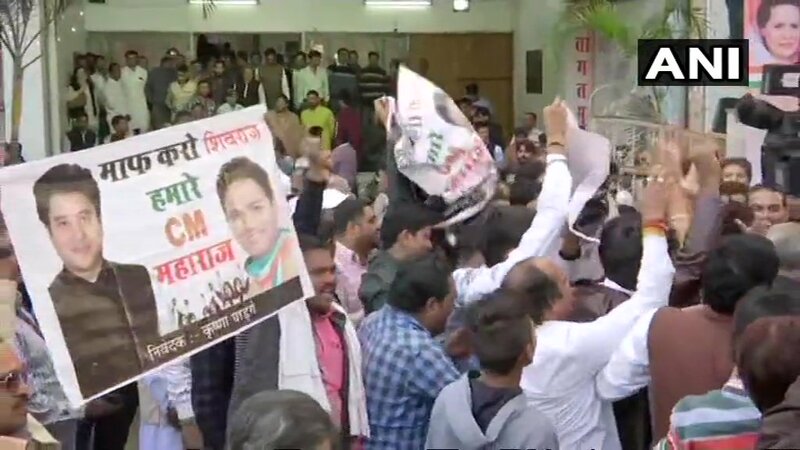 Some of the supporters of Congress campaign committee chief Jyotiraditya Scindia have also come in Madhya Pradesh's capital Bhopal. However, Kamal Nath is said to have emerged as the top contender for the CM post. An official announcement is likely to take place soon. 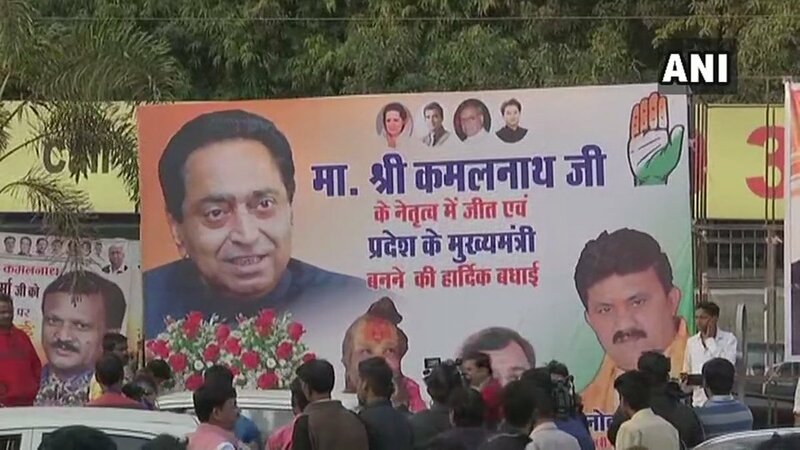 A poster congratulating Kamal Nath for being named CM is seen outside Congress office in Bhopal. Kamal Nath is considered as the front runner for the top post in Madhya Pradesh. The 9 time MP is considered as a Gandhi family loyalist and is the senior most serving parliamentarian in Lok Sabha. Former Congress president Sonia Gandhi has arrived the residence of her son and party chief Rahul Gandhi. A announcement over the selection of the chief ministerial candidates could be made soon. Ashok Gehlot, Kamal Nath and TS Singh Deo are being considered as the front-runners for CM post in Rajasthan, MP and Chhattisgarh. Congress president Rahul Gandhi is likely to address a press conference at 4pm today. The Congress chief is likely to announce the chief ministers Chhattisgarh, Madhya Pradesh and Rajasthan. Ashok Gehlot, Kamal Nath and TS Singh Deo are being considered as the front-runners for CM post in Rajasthan, MP and Chhattisgarh. Congress president Rahul Gandhi said that the leaders are seeking inputs from different people in the party and decision will be taken soon. 'We are taking inputs from MLAs, from workers. You will see a Chief Minister soon,' he told reporters in Delhi. Tajinder Pal Singh Bagga of BJP questions Rahul Gandhi over reports suggesting Kamal Nath is ahead in the CM's race. He said that Kamal Nath is accused on 1984 anti-Sikh riots. "When Rahul Gandhi appointed 1984 Sikh ,assacre murdrer Kamal Nath as in charge of Punjab assembly election, Amarinder Singh protested till his removal. If Rahul Gandhi still appoint Sikh murderer Kamal Nath as CM, Captain Sahab should protest and resign from Congress," he said. Rakesh Singh, BJP's Madhya Pradesh unit president, has offered to resign taking full responsibility of party's debacle in the recently held Assembly polls. The BJP managed to get 109 seats in 230-member House. All the newly elected 114 MLAs of Congress will meet in Bhopal at 4 pm. Earlier on Wednesday, the Congress MLAs had met party observer AK Antony in Bhopal and submitted their feedback. Antony then left for Delhi. Today, he will meet Rahul Gandhi to inform him about the MLAs opinion and the name of next Chief Minister will be announced. According to a report in The Indian Express, majority of MLAs during their interaction with AK Antony and Jitendra Singh, were said to have preferred Kamal Nath over Jyotiraditya Scindia. After the meeting with the Governor Anandiben Patel on Wednesday, when Scindia was asked whether he would like to be the Chief Minister, he replied, "Of course it would be a privilege." Scindia claimed that Congress has the legislative majority with the backing of all four Independents and three MLAs of BSP and SP. Scindia is one of the contenders for chief ministership. The Congress party has won 114 seats in 230-member House, two short of the magic figure. However, the BSP and Samajwadi Party have announced that they will back the Congress to keep BJP out of power. The BSP has 2 MLAs while the SP has 1 MLA. Madhya Pradesh Congress President Kamal Nath with AICC Observor AK Antony and Jitendra Singh, senior party leaders Jyotiraditya Scindia , Digvijaya Singh and others during Madhya Pradesh Congress Legislative Party Meeting, in Bhopal.Madhya Pradesh Congress chief Kamal Nath met Governor Anandiben Patel on Wednesday and staked his party's claim to form the next government in the state. "We have staked claim," he told reporters after the meeting at Raj Bhavan. Late on Tuesday, Nath wrote to Governor urging her to give him an appointment as the Congress emerhed single largest party with 114 seats. The Congress won 114 seats, two short of a majority in the 230-member house. The party enjoys support of 2 BSP and 1 SP MLAs. The Congress had ruled the state last till 2003 when the BJP stormed to the power with a brute majority.